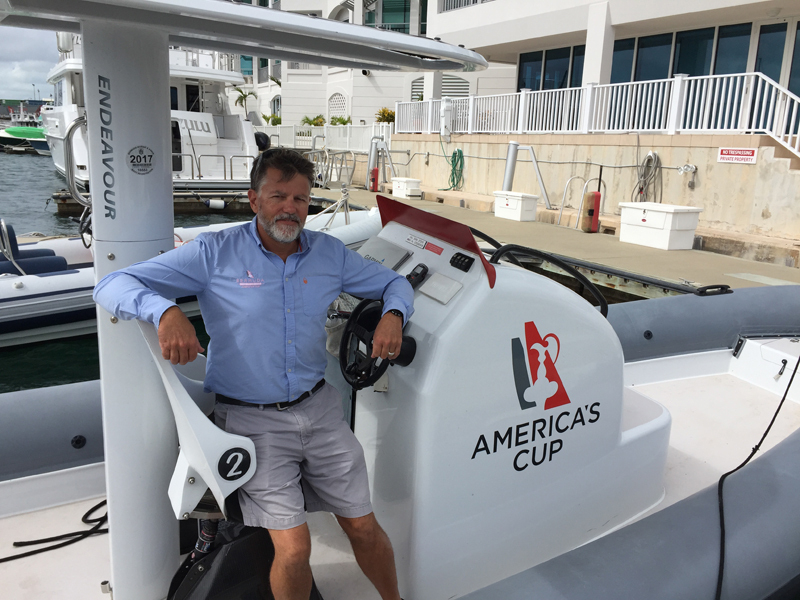 Adam Barboza is the Project Manager for America’s Cup Bermuda [ACBDA]. He was involved in Bermuda’s bid for the America’s Cup in his former role as Sports Business Development Manager for the BTA. Mr Barboza was seconded from the BTA to work for ACBDA when Bermuda won the bid and here he explains his role. 1] Tell us a little bit of your background and what you love most about Bermuda. I am a 48-year-old Bermudian who has been passionate about sailing for my entire life. I graduated from Mount Allison University in Canada with a BA in Geography and Economics. After University, I campaigned for three Olympic Games in three different classes of sail boats, traveling the world to different sailing regattas. During my time competing in overseas sailing events, I always came back home knowing that Bermuda was unquestionably one of the best, year round sailing destinations in the world. I carried that passion with me while working on our AC35 bid and now more of the world is getting to know what an amazing venue Bermuda is for not only sailing events, but the myriad of other sporting activities that our natural environment is conducive to. In short, I believe there is no better place in the world to pursue my passion for sailing. 2] What does your role with ACBDA entail? I am involved with a number of the 14 sub committees that the ACBDA has set up to deliver our commitments under the Host Venue Agreements. I am directly involved with day to day planning and delivery of On Water Ops, Race Management, Health and Safety, Superyachts, Security, Transport, Infrastructure, Red Bull Youth Team BDA, etc. My focus for AC35 will be mainly centered around the safe and effective delivery of the on water race course area. 3] What sort of opportunities have you had through this position? I have some amazing opportunities working with BTA and ACBDA from the inception of the AC35 bid, to the thrill of being announced as the host venue, to seeing all the plans we developed come to life. There are so many fantastic people working behind the scenes, working countless hours to ensure the AC brand is delivered to the highest standards. I had the amazing opportunity of putting many of those plans in to action for the Bermuda LVACWS, learning from those successes and working to improve on them for AC35. 4] How does it feel working alongside a global organization? This is a once in a lifetime opportunity to work with dedicated professionals who simply don’t take no for an answer. It has been fantastic to work alongside the America’s Cup Event Authority and their committed and very professional staff. It is a great team environment including all of the ACBDA team and Committees and no challenge seems insurmountable with such a great crew working on solutions. It has also been very rewarding working with all the AC teams on various aspects of their set up in Bermuda. 5] Have you attended the LVACWS events worldwide and if so, what have your responsibilities been? I have been very fortunate to attend the LVACWS in Portsmouth and Gothenburg in 2015, leading up to the Bermuda event. I have also joined the NY and Chicago events this year. In each one of these, I worked very much behind the scenes, examining the infrastructure, logistical and operation set ups. My main focus on race days has been the way each event delivers their on water operational plan and working with the ACEA, the host city event teams and America’s Cup Race Management on many things including team base compounds, race box sent up, marshaling, health and safety, security, hospitality etc. It is also great to build relationships with each team so they know they have a person to call on if they have questions about Bermuda and how the AC35 will operate here. For a Bermudian, interested in sailing, there is no opportunity that can compare to helping deliver the oldest sporting event in the world to a massive international audience. Congrats Adam, keep up the good Work! this role could have been given to someone else with expererience who does not have job. Really!!! or maybe he is the perfect guy for the job and now there is an opening at the BTA for this qualified individual which you speak of!! Congrats Adam they choose the right person!!! From what I know about you I’m sure you’ll get the job done. Way to go Adam. Your love for sailing (handed down to you by your father} and the water has led you to the top of the mast. We are proud of you and your efforts to improve the quality of sailing in Bermuda and it’s opportunity to become a challenge to the sailing world. Keep up the good work. We knew you had it in you. We’re proud of you. Adam has been an America’s Cup fanatic longer than some of the competitors in next year’s event have been alive! He is the perfect combination of competence and passion to not only win the bid to bring the Cup here but also to make The Bermuda event the great success that it will be.